Two roughly-hewn, black-toned shapes quietly merge into one organic form with a small rectangular piece in mottled-black placed in the upper left hand corner, all pasted on a light grey heavyweight paper. The lower shape carefully constructed with sensuous, curving lines and unfinished with free-formed edges that are roughly torn quietly submits to the hard-edged, massively horizontal upper form in this subtle collage. At the point of contact, the edge of upper form unravels into a gently curving, jagged edge, adopting the more organic nature of its recently digested shape. A smaller rectangular shape, cut from posterboard with a thinly applied coat of black paint set against the hard, vertical edge of the upper form in sharp contrast to the melting shapes below. The shapes applied to a light grey board with a signature in pencil on the lower right hand corner. Born in Kiev Russia, Louise Nevelson moved to the United State with her parents in 1905, settling in Rockland Maine. After getting married, she moved with her husband to New York City where she lived until her death. Nevelson shifted her focus to sculpture in the 1930’s after working briefly with Diego Rivera on a series of WPA wall murals. In 1943, Nevelson developed her sculptural voice through her black assemblages, made from scraps of discarded materials found throughout the city. Working on a monumental scale and painted black, the objects themselves were stripped of their original meaning and reinvented. 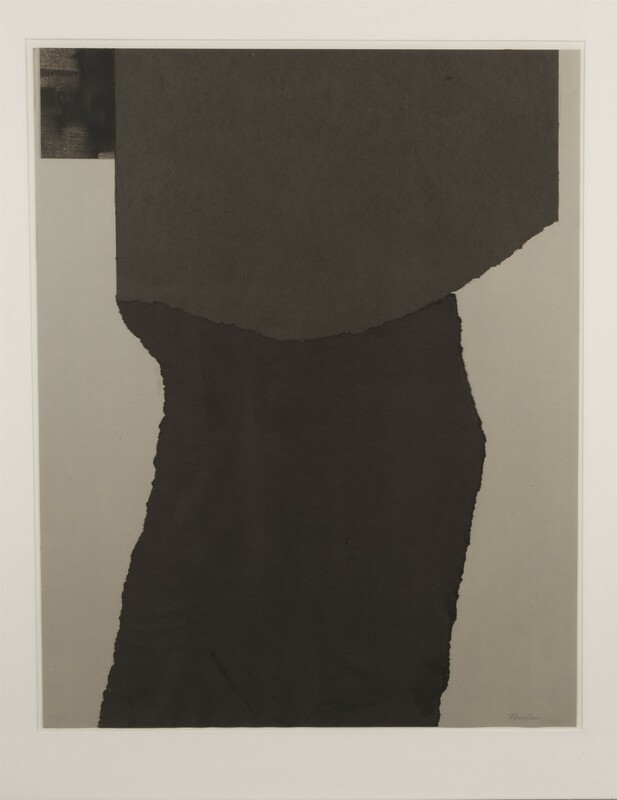 In this piece, Nevelson has applied her technique to works on paper. Using the same idea of appropriation, she has found scraps of paper in a variety of black tones. Working within a rectangular frame, she has created a sensual and intriguing collage touching upon the theme of recombination.